Birkerthwaite Barn in Eskdale sleeps 2 people. Featuring beams taken from shipwrecks on the Cumbrian Coast, this small group of holiday cottages at Birkerthwaite, a former 17th century Lakeland farmstead, lie at the end of an unmade track and are surrounded by tranquil moorland scenery and farmland. This is fantastic walking countryside and the elevated position gives views of Scafell and the Eskdale Valley, creating a unique atmosphere of tranquillity. Birkerthwaite Farmhouse (W43001) is a unique holiday property dating back to 1627 and has many original features, beamed ceilings, flagged floors and unusual oak wall cupboards built in the 1700’s. Comfortably furnished and with the benefit of an open fire and an Aga, the farmhouse is cosy and welcoming. Birkerthwaite Stable (W41477) is a single-storey converted stable with rustic charm heated by a log-burning stove. Birkerthwaite Barn (W41478) has a spacious kitchen/dining room, a galleried landing and a four poster bed. Birkerthwaite Cottage (W41479) has an upstairs open plan living area with wooden floors which opens onto a balcony overlooking gardens. Nearby attractions include Muncaster Castle and Hardknott Roman Fort, whilst the Langdale Pikes and Ambleside on the northern shores of Lake Windermere can be reached via a stunning drive over the Hard Knott and Wrynose Passes. A short drive away is Wast Water; to the west are sandy beaches. Alternatively take the steam train from Ravenglass. Shop 3 miles, pub 2.5 miles. Ground floor: Living room with slate floor. Dining room/kitchen. Bathroom with corner bath, shower cubicle and toilet. Spiral stairs to first floor: 1 double bedroom. Beams throughout. Open fire in living room (initial fuel included). Oil central heating (timed, available Oct-Apr), electric and bed linen included. Video and small library. DVD and small library. Electric cooker. Microwave. Washing machine. Enclosed garden and furniture. Parking (1 car). Natural water supply from spring. Holidays run from Friday to Friday. No children under 10 years due to steep spiral stairs. For a better idea of where Birkerthwaite Barn is, you can see Birkerthwaite Barn on the map below. 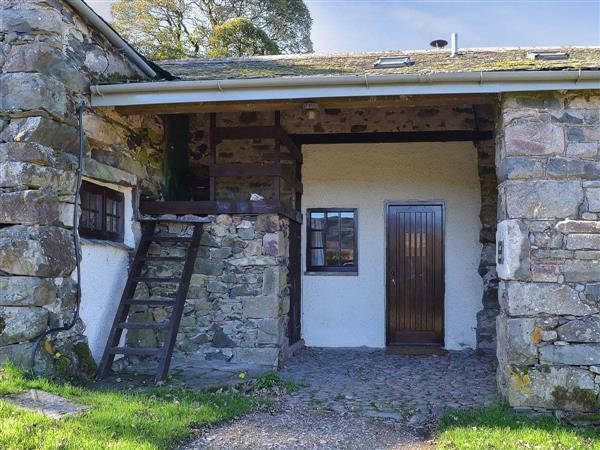 Birkerthwaite Barn is in Cumbria; should you be on the lookout for a special offer, you can find all the special offers in Cumbria. It's always worth checking to see what is on offer at the moment. Do you want to holiday near Birkerthwaite Barn (W41478), you can see other cottages within 25 miles of Birkerthwaite Barn; have a look to find your perfect holiday location.